Who should get the Nobel Prize for cosmic inflation? Tomorrow we might hear some good news about a discovery of primordial gravitational waves and within a few more weeks that could be confirmed in more detail by Planck. If this happens the observational status of the theory of cosmic inflation will change dramatically because primordial gravitational waves have been described as a smoking gun for the theory. Well that may be an exaggeration but the observed scale invariance of the CMB anisotropy spectrum is already a good pointer towards inflation so could the combination be enough to sway the notoriously cautious Nobel committee towards awarding a prize for the theory? Rumors say that Alan Guth and Andrei Linde have been invited to tomorrow’s meeting where the team of astronomers who work with the BICEP2 observatory in Antartica will announce a “major discovery” about B-modes in the cosmic microwave background. E-mode polarisation in the cosmic radiation was produced at the time of last scattering when it decoupled from atomic gas in the early universe. These E-modes could then have been distorted by the tensor modes of the primordial gravitational waves permeating space, twisting the polarisation field of the microwave background into the (hopefully) observed B-modes. So the B-modes are a signature of the gravitational waves that are themselves a remnant of the much earlier inflationary epoch of the universe. The presence of Guth and Linde at this meeting echos the presence of Higgs and Englert at the announcement of the discovery of the Higgs Boson in 2012, and that is probably no coincidence. Just as Higgs and Englert were awarded the Nobel Prize last year for the theory behind the Higgs discovery, Guth and Linde will be prime candidates for any Nobel Prize awarded for the theory of inflation. However, there was much discussion about who else might have deserved the Higgs prize and the similar decision for inflation could be equally awkward and controversial. 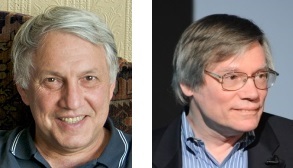 Guth and Linde have already been jointly awarded several honours for their work on inflation theory including the Gruber Prize and Milner’s Fundamental Physics Prize, but the Swedish committee places a higher bar for empirical verification. The general idea of the inflationary universe may pass with the new evidence giving Guth his ticket, but Linde has worked on more specific models of inflation such as slow-roll and chaotic inflation. Brilliant and important though his work is, I am not convinced that he is destined for the Nobel yet. Argue with me if you disagree. Update: after the first 24 hours of analysis Linde’s model of chaotic inflation with quadratic potential appears to be in particularly good shape so perhaps I was being premature. In any case his widely seen status as one of the “principle architects of inflation theory” along with Guth is sure to win him many nominations. On the other hand Guth is not the only one with a claim to the original idea of inflation. It has been recorded that he first had the breakthrough idea on 6th December 1979, gave a seminar on the theory at SLAC on 23rd January 1980 and his paper was received on 11th August 1980. 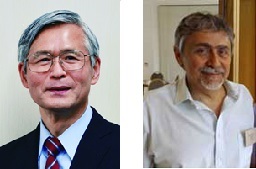 At around the same time Katsuhiko Sato in Japan had written a paper proposing inflation by 21st February 1980 which was received for publication on 9th September 1980, and another similar paper by Demosthenes Kazanas had already been received by 5th May 1980. All three contributions seem to have been independent and similar. The only thing that may have singled out the work of Guth was that his term “inflation” stuck and he was part of a more influential circuit of physicists. Closer examination of dates and the points they made in their papers may separate them, but I think it would be hard to be truly objective about what really counts. I think this is an overly negative view of his contribution and I suspect that it owes more to a bias that tries to rationalize the fact that we do not recognize his work as well as we recognize Guth’s. It is notable that he had already predicted the primordial gravitational waves in 1979 before anyone else had even started thinking about inflation. How the Nobel committee will see it I can only guess. Starobinsky did also win the Gruber prize independently of the prize given earlier to Guth and Linde. 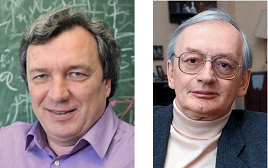 He was recognised along with Viatcheslav Mukhanov who, in colaboration with Chibisov (deceased), first calculated the spectrum of anisotropies from quantum fluctuations during inflation and who could therefore be yet another candidate for the Nobel. Once again the Nobel committee will again be inflicted with the headache that strikes them when more than three people deserve their recognition for the same discovery. Update 26/03/2014: Since the first version of this post I learnt about another thread of discoveries concerning inflationary cosmology that preceded even the work of Starobinsky. In 1965 Soviet physicist Erast Gliner published the earliest known proposal for inflationary cosmology. Andrei Sakharov built on the idea looking at its cosmological consequences including implications for the Horizon problem. A number of papers were written that are now hard to access but a history by Chris Smeenk available online gives a detailed account of their ideas. Another paper by L. E. Gurevich in 1975 is also accessible and shows just how advanced this work had become by that time, five years before the burst of interest in cosmic inflation. Gurevich considered the horizon and flatness problems, primordial inhomogenieties that could lead to galaxy formation and he even speculated about a version of perpetual inflation with multiple universes of “metaglaxies” as he called them. This entry was posted on Sunday, March 16th, 2014 at 3:33 pm and is filed under Uncategorized. You can follow any responses to this entry through the RSS 2.0 feed. Both comments and pings are currently closed. 26 Responses to Who should get the Nobel Prize for cosmic inflation? I think the Nobel committee probably also take into account what the person has done since the discovery to some extent. Linde definitely can be said to have been one of the driving forces of inflation research. Mukhanov I think has also been quite profund in arguing that if inflation is correct one must see gravitational waves at their soon to be announced level. So my vote would be for Guth, Linde, and Mukhanov. If we base judgement on who has a Wikipedia page you will be right but look at all their publication lists in inspirehep and you will see that what you are saying is nonsense. That seems quite a harsh comment. Which part of what I am saying is nonsense? Sorry, did not mean to be hard, but look at the publication list of starobinsky for example. He has been publishing a steady stream of papers on inflation theory in collaboration with people from all over the world since his original work. Perhaps there is something more specific by Mukhanov that would trump the fact that Starobinsky (and others) had the original idea but I dont see it. I am quite confused about why Starobinsky’s role is so downplayed. I was not trying to downplay the contribution of Starobinsky which I agree has been substantial. But Mukhanov being the first to correctly calculate the inflationary perturbations I think is a slightly greater contribution. Although, I have to admit its very hard choosing between the two. There is certainly a case to be made that Mukhanov’s work is directly related to part of the observational evidence and that could swing it for him. I do think it would be a bad thing if Starobinsky was overlooked as the first to really see inflation as a solution to cosmological problems, and his prediction of gravitational waves also looked important now. However you look at it there will be important people left out though. would also be a strong candidate. I was specifically limiting this to the theorists on the assumption that if there was an experimental prize it would be separate. Of course that is a big assumption. One problem is that there are officially four PIs for this experiment according to the press release http://www.cfa.harvard.edu/news/2014-05 which is awkward for Nobel. They may be able to identify who made the most important contributions but it will be sad that they are not all rewarded. However there are hundreds of people in between the original discoverers and the experimenters who are barely mentioned. Who were the ones that figured out the importance of B-modes for example? The phenomenologists who connect the theory to the experiment get the smaller crumbs of the awards if they are lucky and many others who made important steps along the way, and the students who helped get BICEP2 to work, they have to be happy with the satisfaction of their own contribution. That is the reality of the life you choose if you want to be a scientist. That is the reality of the life you choose if you want to be a scientist.